We are pretty open about the fact that we are on the avocado bandwagon. They’re delicious, versatile and healthy. If we could grow them at home, we absolutely would, but growing avocados is actually incredibly challenging. Even the slightest bit of over- or under-watering can result in dry, damaged or moldy pits and seeds that never germinate. No germinating means no avocados, and that means no guacamole. But a simple new product claims it will solve those problems and make our avocado dreams a reality. The AvoSeedo is a small, plastic dish that holds the avocado pit and floats on water. Its bottom is open, submerging the pit in an appropriate level of water. Even as the water level drops, the AvoSeedo falls with it, ensuring that the seed constantly receives the right amount of water. So instead of tossing that pit you pulled from your avocado, you can put it to good use. The AvoSeedo has already run an astonishingly successful Kickstarter, raising almost $25,000 in just a few days—probably because the phrase “avocados on demand” is one of the most powerful in the English language. 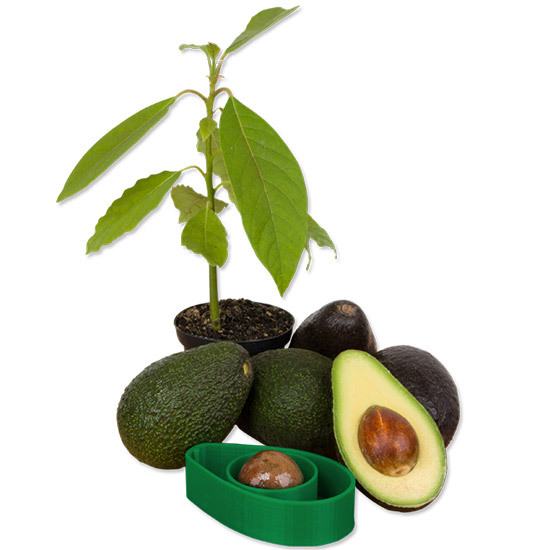 Keep in mind: If you use the AvoSeedo, you are actually growing an avocado tree, so this is a long-term project. But that’s why it’s important to get started early. You can pre-purchase the AvoSeedo for about $9 on the company’s Kickstarter page. Chips and salsa sold separately.